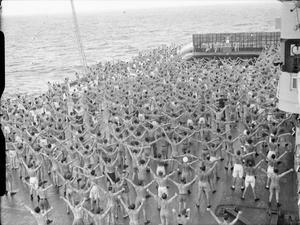 Physical jerks to the music of the Royal Marine Band starts the day well for hundreds of Royal Navy men of the British Pacific Fleet on their way home for demobilisation on board HMS INDOMITABLE. The band can be seen at the far end of the flight deck with the PT instructor who is stood on a platform in front of the lowered lift. Note the wind screens raised at the front of the flight deck.